There is a saying about the Bible that goes like this, “The new in the old concealed, the old in the new revealed”. That may not make sense to someone reading it for the first time but it’s talking about the two divisions of the Bible, the Old Testament, and the New Testament. There are prophecies in the Old Testament that are hidden or concealed, but with careful study, they are fulfilled, or revealed, in the New Testament. Some of the things that are hidden in the Old Testament are known as “types”, meaning a symbol, something that represents something else. One of the more popular types is in Genesis 22 in the story of God asking Abraham to sacrifice his only son, Isaac. The son, Isaac, is a type of Jesus. Although God stopped Abraham from killing Isaac, God still sacrificed His only Son, Jesus, on Calvary. One of my favorite types is contained in the Book of Exodus, chapter 12 when God told Moses to tell every family of the Children of Israel to take a lamb and kill it at the threshold, then with a branch of hyssop dipped into the blood in the basin, strike the blood on the lintels (top) and door posts. Then as an angel of death goes through the land every entrance splattered with blood will be passed over, the family inside the house will survive and live. 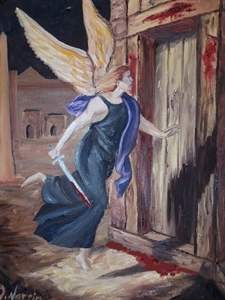 However, as the same angel of death sees the doors not covered in blood, such as the Egyptians, the angel will enter and the firstborn will die. Here is the story as told in Exodus 12:21-23. It is given in the King James Version for an important reason and will be explained later. In this story, the lamb will be revealed in the New Testament as a type, or symbolic of Jesus offered up at Calvary as a sacrifice for the sins of man. The door represents the heart, or soul of every individual who acknowledges and willingly accepts, that he or she has been washed in the Blood of Jesus. On the eve of the Exodus, when the people put the blood on the lintel and doorposts it covered three parts of the door. But what about the bottom of the door? Nothing is said about applying the blood to the bottom. That is where we must look closely at Exodus 12:22 for an explanation of a particular type. Note the word, “bason”. In versions of the Bible, other than the King James, bason is translated as basin or bowl. This is incorrect. As explained by A. W. Pink in his book, Gleanings In Exodus, bason in the original Hebrew was the word “sap”. Sap is actually an old Egyptian word meaning threshold. Most thresholds of that time, had a trough, or shallow ditch dug before the threshold to carry away rainwater. Now get the picture: On the night before leaving Egypt, the head of every home of the Children of Israel would take a lamb outside in front of the door and kill it by cutting its throat. As the blood of the lamb flows, it falls to the ground at the threshold and runs down the “saf” or ditch. Then hyssop is dipped into the blood from the ditch and spread on the sides and top of the door. This is a type of the sinner accepting the death of Jesus for his/her sins and receiving salvation. Remember that every part of the entrance was covered in blood, the top, the sides, and the bottom. That is symbolic of the complete, perfect, and finished work of Jesus. There is nothing more that can be added to secure salvation. On the cross Jesus cried out, “It is finished!” and He meant just that. Good works will not get anyone in Heaven. Church membership will not get anyone in Heaven. Tithing 100% of their income will not get anyone into Heaven. Being in church 24/7 will not get anyone into Heaven. Being related to the Pope will not get anyone into Heaven. In fact, even the Pope will not get into Heaven unless he does just as everyone else is required to do, to accept the finished work of Jesus and know the Blood has washed away his sins. Jesus did it all on the cross and the only thing we are expected to do is accept it by faith. Remember when God told Moses the people were to take a branch of hyssop and dip it in the blood of the sacrificed lamb? Hyssop is a common plant that grows in the Middle East. In this story of the Exodus, hyssop was used as a kind of paintbrush, or sponge, to spread the blood of the lamb onto the lintel and doorposts. In typology or the study of types, the use of hyssop was a type of applying the Blood of Jesus to every problem in life, beginning with our own salvation. When we are confronted with any type of problem, financially, physically or spiritually, we are to be reminded of the application of the blood with the lowly plant of hyssop, a weed that grows insignificantly but instructed to be used by God to bring Him the glory in the salvation of His people. The sinner is also represented by hyssop, a common plant with no special purpose, destined to burn like a weed invading a garden. Before salvation, a sinner is destined to burn in the fires of Hell. But for God and the one, final sacrifice of a Lamb for our salvation, Jesus, when God sees the Blood on the portals of our heart we blossom like a beautiful flower. We’re translated spiritually and become Children of God. God has a purpose for the life of every person who accepts Him as Savior. And one fine day when we are called home, our destiny is to live with Him for all of eternity! But it all begins when, “He sees the blood . . .”.